I was born in Shawnee, OK, on June 8, 1978. During my youth, hunting, fishing, and camping were my principle outdoor activities. I would play with snakes occasionally, but was discouraged from messing with "dangerous" creatures. In 1996, I graduated from Shawnee High School and went straight to work in a factory. After three months, I decided that I wanted more out of life than what a factory job could give. Considering the options, college seemed like the only feasible means of a prosperous life. I studied for the next two months for my ACT (which I never took in high school). The next step was to consider a major, and then a college where that major is offered. That following fall (1997), I enrolled at Murray State College in Tishomingo, OK, with a major in conservation and wildlife management. The Spectacled Caiman is not an Oklahoma native, but it is a representative of the Family Alligatoridae which does occur in Oklahoma. My first year of college changed my life. I made the decision for salvation, became introduced to rollerblades, and met my wife. My wife and I were married on Aug. 15, 1998, and lived in Tishomingo for the next two years while we finished college. During that time, we became acquainted with some friends, who would turn out to be some of our best friends. They introduced us to a great church in Shawnee, Faith Christian Outreach, where we currently attend. After graduating with an Associate of Science (A.S.), I decided that it would be wise to continue my education to a higher degree. After moving back to Shawnee, I attended St. Gregory's University as a Conservation Biology major with an emphasis in herpetology. The associate professor of zoology gave me the opportunity to work as a lab assistant in the biology lab and put me in charge of the reptiles and amphibians in the "living museum", which at that time were two copperheads and a great plains toad. I took that as an honor, considering that he has never given the responsibility of caring for the venomous collection to anyone else. Working together with my advisor as a lab/field assistant, we increased the collection to include a large number of native reptiles and amphibians. During the 2 1/2 years I spent at St. Gregory's University, I have led field trips for Oklahoma Academy of Science, and led field trips and given presentations for schools around the state. I have met many interesting and colorful characters through my field trips, many of which I have made life-long friendships with. One such friend is Robert Jadin. Robert and I met at an OAS field meeting at Roman Nose State Park and have remained friends and co-leaders of each other's trips ever since. I also met Dr. Bruce Smith at an OAS field meeting and have remained close friends with him. Dr. Smith, a botanist and authority of Oklahoma's ferns, has given me the opportunity to be a Zoology instructor during the summers at the University of Oklahoma Biological Station at Lake Texoma. 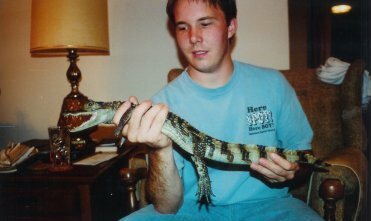 After graduation from St. Gregory's University in December 2002, I have worked as a reptile and amphibian specialist at a local pet store. (I am by no means an advocate of herpetoculture, but it was the only paying job I could get related to my field of study, plus I get to interact with people and teach about the animals I enjoy studying about.) I have also been taking every opportunity to give herpetology presentations at various schools. Beginning in 2004, I have been getting "hired" to do birthday parties, have given presentations for the Seminole Nation, and even a church youth group. 2006 has also been a life-changing year for me. In April, my wife and I welcomed our first child into our lives. Riley was born on April 25. I spend quite a bit of time playing with my daughter and she makes each day worth it. I have also started a new career as a teacher. I am currently a science teacher at McLoud High School. Another earmark moment occured in 2008, with the birth of my son, Brandon, born May 23. He has been a tremendous blessing, although he is so much different than his sister. I guess that's how siblings are supposed to be! I now have the perfect family, with a loving, understanding, and supportive wife, a quiet, well-tempered daughter, and wild and very energetic son. What more could I ask for? Now my current plans are to attend graduate school and pursue a PhD in Zoology, with a major emphasis in herpetology. Teaching public school has been challenging to say the least, and anyone with a desire to teach public school has my respect, but also requires a slight tendency toward lunacy. I require more field opportunities, and teaching public school in a formal classroom setting just simply does not offer that. For me, a graduate degree would give me more opportunity to go afield, either as a professor teaching field-oriented biology courses, or doing survey work for an organization, institution, or museum. Either way, I get outdoors more where my passion truly lies.